I have tested some of the most popular and free FAQ Plugins for WordPress so that you don’t have to. 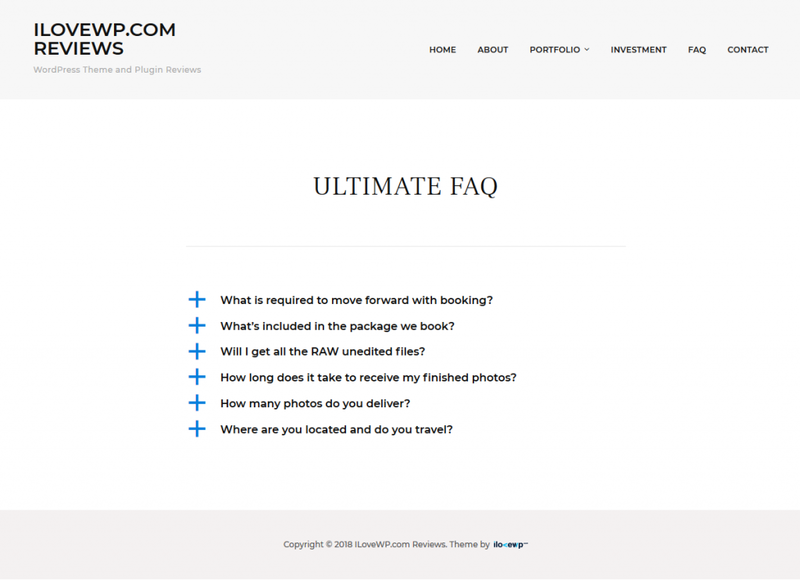 If you’re looking to create a Frequently Asked Questions (FAQ) page, section or widget on your WordPress website then this article is for you. Generally you do not need a plugin to build a simple FAQ page on your website, because when you get down to it, it is a simple set of questions and answers. 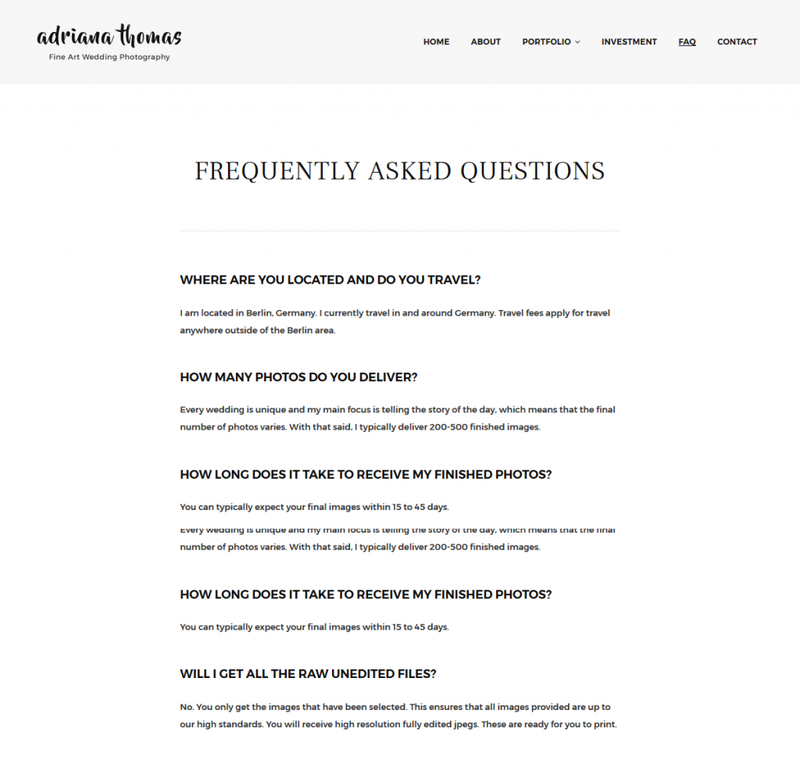 For example our PhotoFrame WP Theme for Photographers – you can easily create a minimalist FAQ page without having to bother with an extra plugin. What’s the correct HTML markup for a FAQ section? Opinions vary on what’s the semantically correct HTML markup for a FAQ section. Should you write it as a ordered/unordered list (<ul></ul> <ol></ol>)? Should you use a definition list (<dl><dt></dt></dl>)? Now that we got this out of the way, onward with our review! 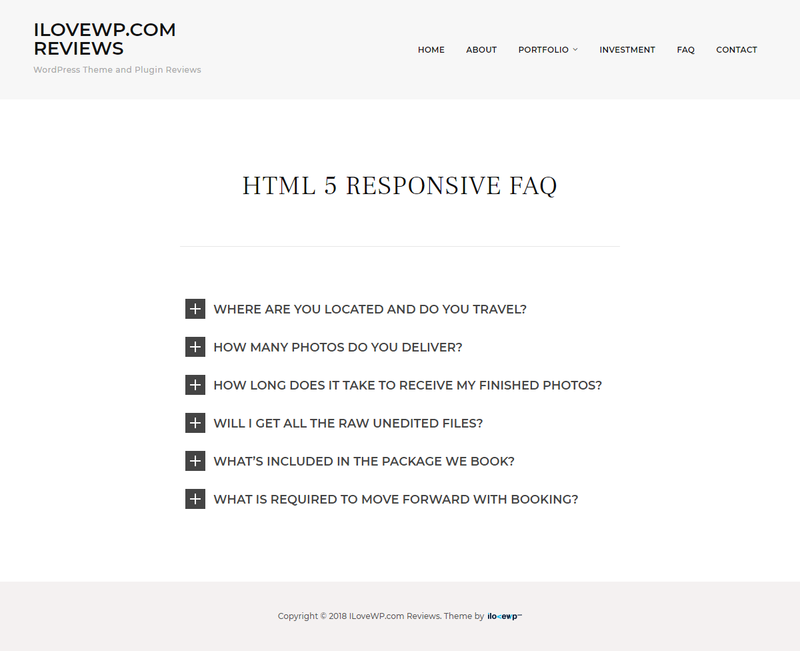 I will be testing the most popular free FAQ plugins that are currently available in the official WordPress.org Plugin repository using the sample questions from the screenshot above. Let’s see if we can make our list of questions look better than the plain text version. I’m hoping to determine when and how to use these plugins, which ones work using shortcodes, which ones come with custom widgets, etc. For this review I will continue using my PhotoFrame Theme, just to keep things consistent. The theme’s default page content width is 660 pixels, but in Full Width mode it goes up to 1100 pixels. In both cases there are no sidebars to distract us, so we can focus on our FAQ section. 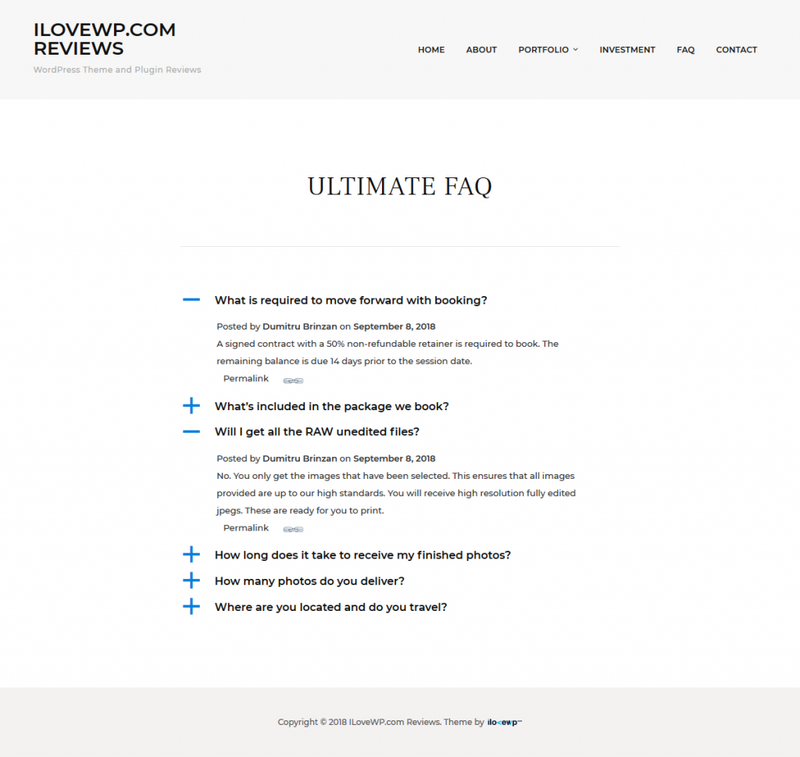 Ultimate FAQ is the most used FAQ WordPress plugin, so we’ll start with it. Without any configuration or changing any of the plugin’s settings, I have quickly created my 6 questions (as separate posts of the FAQ custom post type). Clicking the large plus signs opens up each question separately. Each click is tracked by the plugin and the website administrator can see the number of hits (views) that each question got. The plugin comes with a bunch of settings and options, but many of them are locked and are available only to users of the Ultimate FAQ PRO plugin version. A single site license currently costs $30. One of the things that I dislike about this Settings panel is that it is not immediately clear which options are available and which ones are locked. It takes a minute to go through them and fully understand the possibilities and limitations. What I preferred to do is the following: I disabled the FAQ toggle, as I don’t see a good reason to make the visitor click on each question, as in this particular case I have plenty of space to display all questions and answers immediately. The plugin provides five! (5) custom widgets, which sounds like an overkill: Popular FAQs, Random FAQ, Recent FAQs, UFAQ FAQ Category List, UFAQ FAQ ID List. An issue that immediately jumped to mind is that these widgets don’t use the proper widget title markup as defined by the theme. It simply wraps the widget’s title in a H3 tag, which is not ideal. This will likely cause styling issues in most WordPress themes, both free and paid. When the plugin is active it loads 2 CSS files in the header on all pages, even the ones that don’t have anything to do with the FAQ section. It is a plugin that you can get started with very quickly. I did not have to search around for help or documentation, everything was pretty intuitive. It is surprising to me that a plugin as popular as Ultimate FAQ has built-in widgets that are so poorly written. Instead of 5 widgets there could easily be just 2, and as a theme developer it pains me to see that they don’t honor the theme’s widget title markup. Another thing that I dislike however is the aggressive promotion of the PRO version of the plugin: you’re constantly reminded that you can buy a license for it. Moving on to the next plugin. The plugin comes with a very simple settings page that provides very little customization potential. The options are mostly about font styling: size and color. The plugin also makes 2 additional HTTP queries to 2 images on all pages: open.png and close.png (plus and minus signs). Why not a sprite? A light plugin without many bells and whistles. If you need to create a simple page with a collapsible list of questions (or other items) then this plugin could be for you. Unfortunately it comes without the option of displaying the list of questions in expanded mode by default. “Cannot load quick_and_easy_faqs.”. So that link doesn’t work right now. After creating my 6 questions I have discovered that there are no instructions on how to actually include them on the page. I had to go to the plugin’s page on WordPress.org to find the correct shortcode: [faqs]. So far this is my favorite output of the questions list, so that’s good. The plugin’s Settings page is simple and provides only color controls. But I don’t think that I need to do anything about it, as I’m perfectly happy with everything as is. I really like this output of the questions list. In my opinion it is so much better than the previous two plugins. It also does a great thing about loading its resources only when they are needed, and not just on every single page of the website. Good! This plugin works in a different way that the previous ones. Instead of creating separate posts for each question, you simply create an accordion which can hold multiple items inside it. Everything is done from a single (large) page. It is a bit overwhelming at first. It is curious that the plugin forces you to choose a certain font to be used instead of relying on the one used by the theme. The plugin loads 2 CSS and 2 JS files on all pages of the website, even on those that don’t display an accordion. The plugin is a little overwhelming at first, which works against it. The many text typos in the plugin’s description and settings also leave a bad impression. So far this plugin is my least favorite. Next. Using this plugin you also have to create separate posts for each question. Then you simply add the [faq] shortcode to any page or widget and you will get your block of questions. You can also use the shortcode [faq style=”accordion”], which will keep only one of the questions expanded and will close the rest. Even though accordions are not very user friendly, they allow you to save some space when you really need to. The plugin does not offer a settings page, only a FAQ & Support page with a few instructions on how to use the plugin. I like it, even though some more customization controls would be nice. This plugin also works by using a shortcode which you can add to any page, post or widget: [sp_faq]. The plugin doesn’t provide any built-in customization settings, so there’s nothing you can change without writing your own CSS code. If you’re happy with the default accordion style then you can use this plugin. I’m not happy about the plugin making two additional HTTP queries on all pages just because it is active. This combined with the lack of customization options makes me consider other plugins instead. This plugin has proved to be a complete waste of time. From the confusing UI and wording to incomplete documentation pages, I have still not figured out how to use it. Let me explain. The plugin lets you create three types of content: FAQs, Questions and Categories. What’s the difference between FAQs and Questions? I have no idea. The plugin developers do not explain that. There’s also a proprietary UI to create all these things, and not the usual WordPress UI. Why? No idea. At this point I gave up on it. Do not install this one. 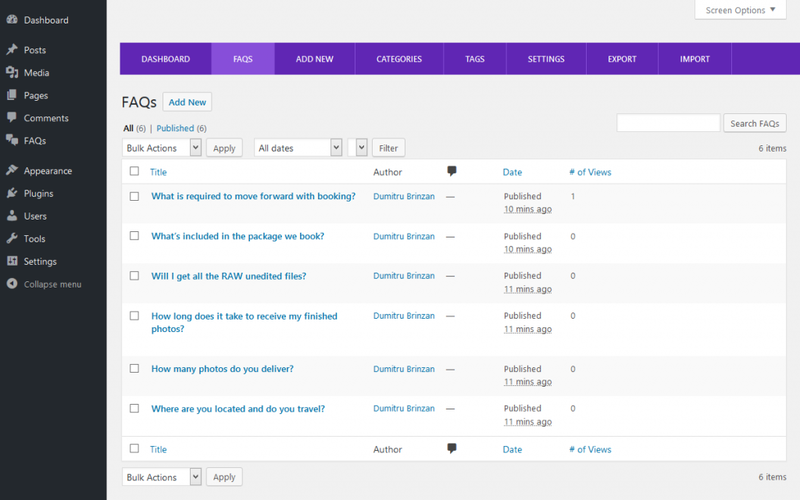 This plugin lets you create Tab posts, which can contain multiple entries inside them. The UI also does not match the general WordPress style, so you have to invest time to learn how things work. The plugin also adds an immense amount of inline CSS code to the page containing the Tab shortcode. Yet another plugin with a confusing proprietary UI that is more confusing than it should be. I do not recommend it. This plugin works only with WordPress websites powered by the Genesis Framework. So Which is the Best WordPress FAQ Plugin? If you’re very eager to use a plugin, then from a developer’s point of view, my personal opinion is that your choice is between only two plugins: Quick and Easy FAQs & Arconix FAQ. If you want to create a larger page and space is not an issue, then you should use Quick and Easy FAQs. If you don’t have a lot of room then stick to Arconix FAQ. Have I missed any popular FAQ plugins that I should add to the list? Have your say in the comments below. Previous ArticleWordPress Image Sizes: a Ticking Time BOMB?